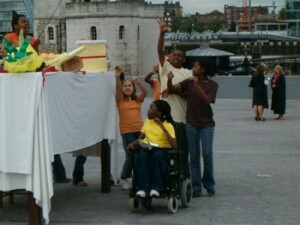 As part of the celebrations to open Tower Hill and the new visitors area at Tower of London, which was officially opened by HRH Queen Elizabeth II on 9 July 2004, Half Moon’s Youth Theatre created a performance entitled What a Dainty Dish. The performance was seen by the Queen and Prince Philip and was part of a big programme of events for the community that day with the theme of food and celebration, connecting to an art installation created by Sophie Layton. The young people’s performance was large-scale to make it work for the outdoors. The action centred around a 6-foot tall table and props and costumes created by the young people that represented their favourite food and explored who lived under the table, inspired by the stories of The Borrowers. The performance descended into a playful food fight, in front of Her Majesty the Queen! Jacqui Adeniji-Williams, ex Youth Theatre member and disabled artist, talks when Half Moon Youth Theatre performed for the Queen at the Tower of London. Interviewed by Rio Puffett. Daryl Beeton was an actor and drama facilitator who worked for Half Moon Theatre before becoming Associate Director at Half Moon Theatre in the early 2000s. He talks about a Youth Theatre production, What A Dainty Dish, which was created to help celebrate the opening of the re-landscaped Tower of London. Interviewed by Toni Tsaera. Have you got a memory you’d like to share? Or perhaps you have a programme or poster from one of our shows that we're currently missing? Then we want to hear from you! The website is a living archive and we will continue to add information as it comes to light. Celebrating the rich heritage of Half Moon Theatre from 1972 to the present. 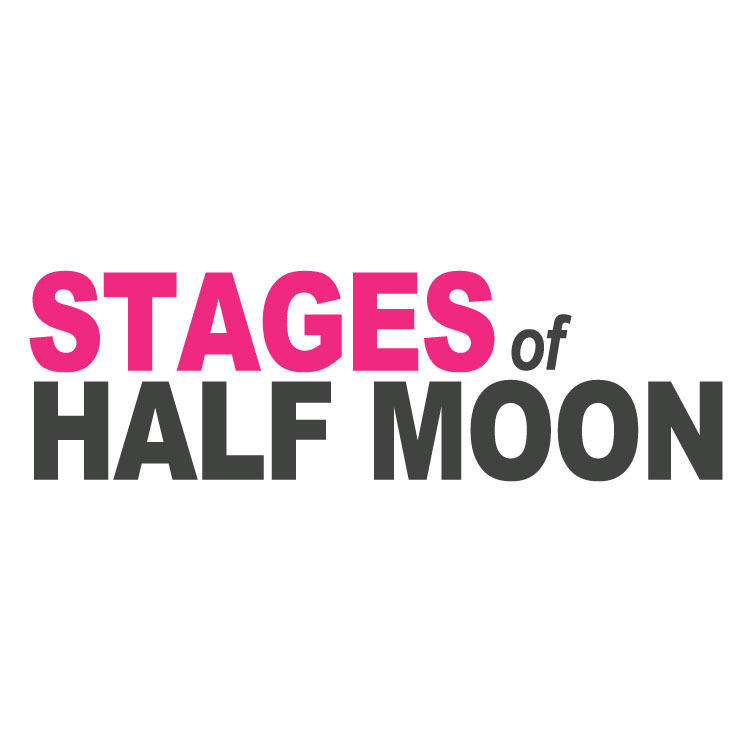 Explore the archive and discover the Stages of Half Moon through photographs, programmes, news stories, documents and filmed interviews. Keep up to date with the latest news from Half Moon by signing up to the regular e-newsletter. © Copyright Half Moon 2016. Registered Charity 1010192. Registered Company 2479179. Site design and build by Buzzword.